(TibetanReview.net, Mar22, 2018) – The Vienna Declaration and Programme of Action says non-governmental organisations “should be free to carry out their human rights activities, without interference”. 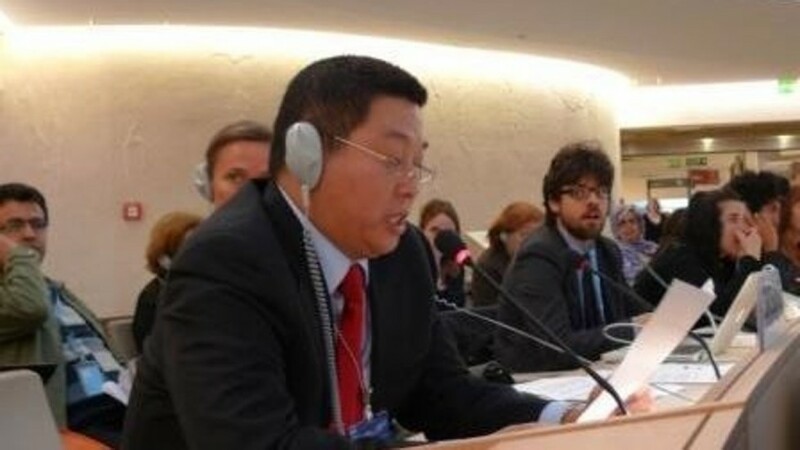 And sure enough, on Mar 20, as Yang Jianli, a dissident in exile in the United States, addressed the UN Human Rights Council during its debate on this particular issue, the Chinese government delegation repeatedly intervened to try to stop him from talking, but without success. Chen Cheng of China’s diplomatic mission stepped in and insisted that Yang’s intervention “seriously affected the reputation of council, and it should be firmly opposed”, reported the scmp.com Mar 21. But, the report said, Yang was able to go on to cite events from decades of recent Chinese history, including the Great Leap Forward, the Cultural Revolution and the crackdown on the Falun Gong and democratic movements. And when Yang said “millions of people have died,” Chen interrupted again, appealing to the chair to “rule against his speaking”. But invited to continue speaking instead, Yang warned that China “will return to the road of personal dictatorship” to control speech and crackdown on activists, churches in Xinjiang and Tibet, the report added. Yang had participated in the pro-democracy demonstrations on Beijing’s Tiananmen Square in 1989 and served five years in prison in China. He was invited to appear before the Human Rights Council meeting by UN-accredited advocacy group UN Watch.